Providing you the best range of horizontal glass yarn covering machine with effective & timely delivery. This machine is designed to insulate round or flat conductors by applying glass fibre yarn , immersing in varnish and oven curing. Glass Fibre Yarn Covering Spinners with auto-stoppage arrangement if yarn breaks or pad ends-up. AC / DC / SERVO Drive Control Panel. 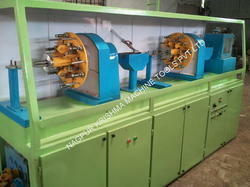 Looking for Glass Yarn Covering Machine ?